We are based in the Department of Computing on the Goldsmiths campus in New Cross, London. Please address all administrative questions to Catherine Bellamy, whose email address is: c.bellamy@gold.ac.uk. The nearest railway is New Cross Gate station. From New Cross Gate station, cross the road (New Cross Road), turn left and follow to the crossroads of New Cross Road, Goodwood Road and St James. 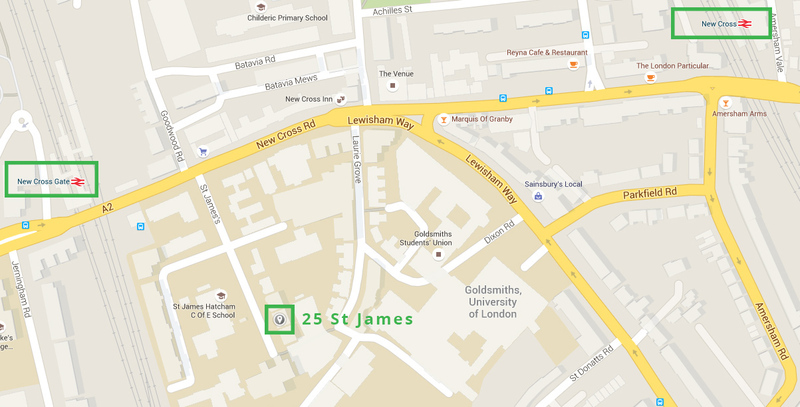 Turn right onto St James and at the end of the road 25 St James will be on your left hand side.